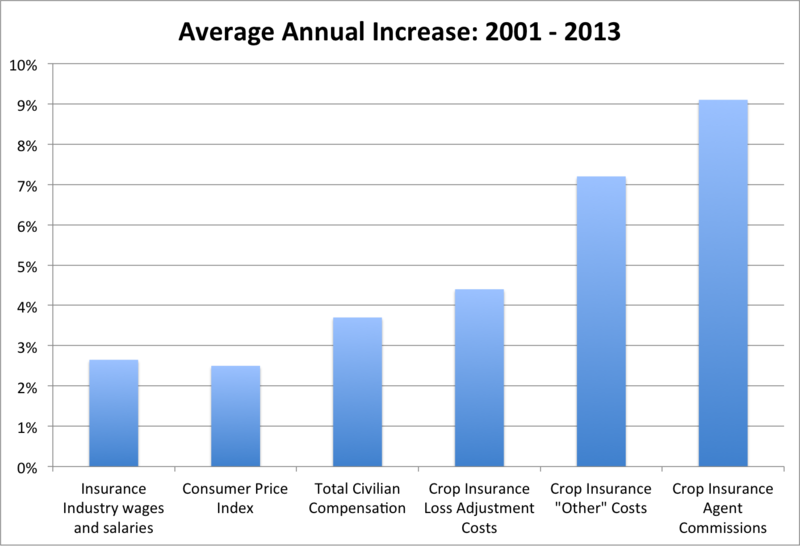 Notably, the commissions paid to crop insurance agents grew by an average of 9.1 percent per year between 2001 and 2013, more than three times the annual increase in the consumer price index and over twice the rate of increase in Americans’ total compensation over the same period. The rapid escalation of costs has drawn well-deserved attention from policymakers looking to cut federal spending. The budget deal passed by Congress and signed by the President in early November would cut the cost of subsidizing the program by reducing the target rate of return enjoyed by crop insurance companies from 14 percent to 8.9 percent. This reduction would generate an estimated savings of $3 billion over 10 years. Now, however, the industry and the agriculture committees in Congress are mounting an all-out effort to undo the cuts in the ongoing negotiations to prevent a threatened government shutdown on December 11. The reality, however, is that the cuts are a modest reduction in taxpayer support for crop insurance. The Congressional Budget Office pegs the average taxpayer cost of the program at $8.5 billion per year. The $300 million represents a reduction in subsidies of just 3.5 percent. The costs of using crop insurance companies to deliver the federal program include commissions to insurance agents, paying insurance adjusters to handle claims, salaries of company employees and basic office expenses. The primary impact of cutting the rate of return to the companies would not be a reduction in profits but rather a reduction in industry costs. Rather than devastating or killing the program, the lower subsidies would result in a more efficient (but still far from lean) delivery system. 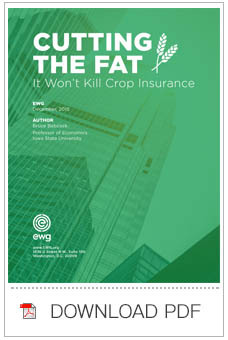 The total cost of delivering crop insurance – largely the wages, salaries and commissions paid to agents and employees – grew at an average rate of 8.2 percent a year between 2001 and 2013, driven largely by an average 9.1 percent annual increase in commissions paid to the insurance agents and a 7.2 percent increase in costs per policy not associated with loss adjustment. Over the same period, wages and salaries in the insurance industry as a whole grew by only 2.7 percent a year, the consumer price index rose by just 2.5 percent a year and total compensation to civilian employees by 3.7 percent a year. These costs grew while the number of policies sold stayed about the same. As a result the cost per policy grew from $628 in 2001 to $1,670 in 2013. Crop insurance companies’ costs have inflated so dramatically because of the peculiar nature of competition in the industry. Companies can only sell insurance products that are approved by USDA’s Risk Management Agency at a government-regulated price. The companies don’t compete on price or on the products they offer and have limited ability to compete on quality of service, because most of the policies are sold and serviced by independent agents. Instead, the companies compete for the agents’ customer base by offering higher commissions. When federal subsidies soared because of high commodity prices in the mid-2000s, competition for business dramatically increased agents’ commissions. The average commission per policy grew from $358 in 2001 to $1,022 per policy in 2013. The industry has plenty of room to reduce costs while maintaining a more than healthy rate of return even if its revenue falls by $300 million a year. If the annual increase in crop insurance companies’ costs had been held to 3.7 percent – the rate of increase in total civilian compensation – those costs would have been reduced by $767 million in 2013. Agents’ commissions would bear most of brunt of the proposed cost cutting because their commissions increased faster than the other components of the companies’ delivery costs. Farmers won’t see any increase in premiums because premiums are set by the government, not the companies. The $300 million annual cut in subsidies will not cause compensation rates for agents and others in engaged in crop insurance to fall below industry standards. There is no reason to think there would be a large exodus of agents or companies from the crop insurance program. Instead of devastating the program, the subsidy cuts would make the program more efficient and less costly for taxpayers.